In order to meet the demand for high performance power supplies for customers with large scale fixtures in the LED luminaire market, meet the 600 Watt HLG-600H Series. The "A" Type, with adjustable voltage and current, can be used to provide power in many thermoelectric applications such as cooling/warming outdoor enclosures. 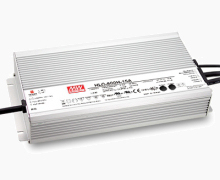 HLG-600H are 600 Watt, extremely efficient (with active PFC), waterproof, LED power supplies, primarily for heavy duty lighting applications. With a 90~305VAC wide AC input range the HLG-600H series will naturally operate with general 115VAC or 230VAC main input, but can also be operated with 277VAC allowing for operation in 277 Volt circuits for lighting in industrial and commercial 277/480-volt systems in North America. The HLG-600H series utilizes state-of-the-art, high performance circuit design that provides remarkable, up to 96% efficiency, tops in the industry. This efficiency means little heat buildup and allows for cooling by natural (free air) convection. All models are able to operate in ambient temperatures from a chilly -40 ºC (-40 ºF) up to +70 ºC (158 ºF). Also able to withstand vibration up to 5 Gs, and industrial-level immunity against instantaneous surges up to 4kV (meets EN61000-4-5), the series will work reliably in a wide variety of indoor and outdoor, dusty, moist, and vibrating environments. The HLG-600-H series is also available in a variety of other output voltages including 15 Volt, 20 Volt, 30 Volt, 36 Volt, 42 Volt and 54 Volt versions. Contact us for price and lead-time for any of these. A Type is equipped with removable rubber plugs that protect internal potentiometers from the elements. Removing the plugs allow the user to manually adjust either, or both, DC output voltage (from 85~105%) and/or the output current (between 50~100%) of the nominal values. Because of the removable rubber plugs that seal the potentiometers, the A-type has and IP rating of 65 (dust tight and protected against water jet with nozzle). B Type is IP67 rated (dust tight and protected against the effects of immersion) and is equipped with a three-in-one dimming function. Input/Output by cable, Io can be adjusted by 1~10 VDC, PWM signal, or resistance. Other features and functions include an active PFC function, short circuit protection, over current protection, over voltage protection, over temperature protection, built-in 5V/0.5A standby power, built-in remote control, and less-than 0.5W no load power consumption at remote-off. 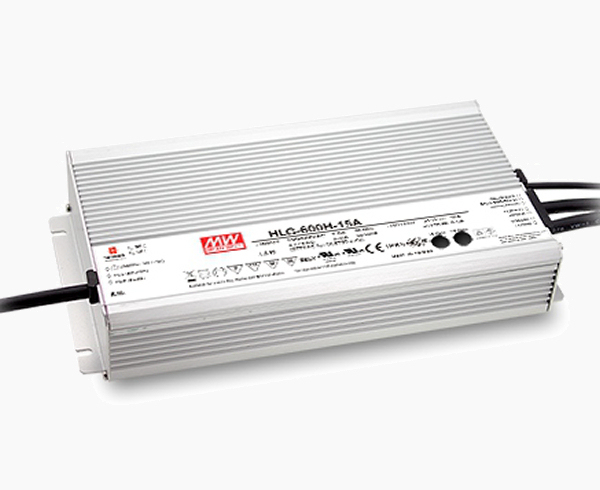 These high efficiency power supplies are very suitable for general indoor/outdoor LED lighting, LED street lighting, LED high-bay lighting, outdoor electronic display, LED decorative lighting, LED tunnel lighting, LED searchlights and fishing lamps and many other outdoor electronic installations with moisture and or dust, such as outdoor mechanical or electrical equipment and telecommunication base stations. The HLG600-H Series have global certificates for, and comply with, UL / CUL / ENEC / CB and CE UL8750 and ENEC EN61347-2-13 lighting related regulations. Meeting these requirements assures your equipment will meet global safety and EMC regulations. "A Type" HLG-600H supplies can be used as the power supply for many thermoelectric applications. Purchasing agents and other quantity buyers are encouraged to request a quotation. Pollock Industries is the world-wide supplier of Advanced Thermoelectric's ElectraCOOL™ brand thermoelectric modules and assemblies. The company also offers a wide range of power supplies and related equipment.